George (György) Gömöri is a Hungarian poet, translator and scholar who now lives in London. He left Hungary after the revolution in 1956, in which he was a student organiser and editor of the journal University Youth. He has published eleven volumes of poetry in Hungarian and two in English, My Manifold City (1996) and Polishing October (2008), both translated by himself and Clive Wilmer. Other collaborations of his with Clive Wilmer include works by Miklós Radnóti (1979, 2003) and György Petri (1991, 1999). Together with George Szirtes, George Gömöri has also co-edited an anthology of modern Hungarian poetry, The Colonnade of Teeth (1996). 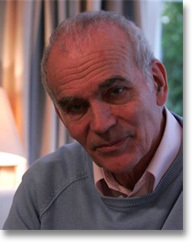 A retired Lecturer from the University of Cambridge, he is Emeritus Fellow of Darwin College, Cambridge. His literary prizes include the Salvatore Quasimodo Prize (Balatonfüred, 1993), the Ada Negri Prize (Lodi, 1995) and the Pro Cultura Hungarica (1999). He is a member of the Editorial Board of the American magazine World Literature Today and Foreign Member of PAU, the Cracow-based Polish Academy of Arts and Sciences.